We've just updated SMI's Personal Portfolio Tracker and our monthly Fund Performance Rankings report to reflect mutual-fund performance data through Jan. 31, 2019. The Portfolio Tracker: The online Tracker personalizes SMI's fund rankings to your specific situation. You can take the full universe of 20,000+ mutual funds we follow and transform the data into a concise report covering only the funds available in your 401(k), 403(b), or other retirement plan(s). 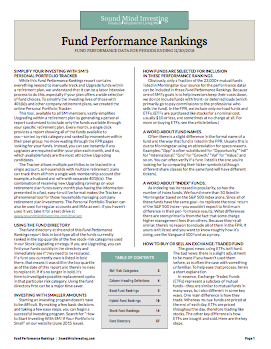 Fund Performance Rankings (FPR): The FPR report is a PDF file containing performance data — along with SMI's momentum rankings — for more than 1,600 no-load funds and ETFs. The funds included have been selected on the basis of asset size, brand familiarity, and brokerage availability. Check page 2 of the FPR report to learn how to use it. Page 3 includes an overview of the 70+ risk categories that will help you compare "apples to apples." Page 4 has explanations of the various data-column headings.